In Secret Theatre’s version of A Streetcar Named Desire, Blanche’s famous line raised a light, knowing chuckle from the audience. The character might have been referring to her inclination towards fantasy and illusion, but her words could well have been a mantra for the production, which turned Tennessee Williams’ play and all its well-worn visual tropes inside out. Those words, spoken in that context, also posed an implicit question. Why, on the stage, do we settle for realism when we could have magic? I’m reminded of the frustrated words of Eugene Ionesco: “I personally would like to bring a tortoise onto the stage, turn it into a racehorse, then into a hat, a song, a dragoon and a fountain of water. One can dare anything in the theatre and it is the place where one dares the least”. In theatre, where one thing always stands for another – when the relationship is one of metaphor – why do we still insist that those two things look alike? Partly liberated by the secrecy bound up in the project (show titles are not released in advance), Secret Theatre’s Streetcar somehow freed the play of all its – and particularly Blanche’s – baggage, presenting us instead with its exposed innards. It understood theatrical representation as metaphor in its most playful sense; chunks of watermelon stood in for poker chips, and Blanche’s endless glasses of liquor became liberal drenchings of water. It was not quite magic, but it certainly wasn’t realism. By comparison, Benedict Andrews’ new production feels sort of drab, dull even. First, let’s be clear: Andrews’ take on Streetcar isn’t exactly realism. There’s a stylishly skeletal revolving set, garish washes of coloured light, scene changes underscored with Swans and Chris Isaak. But in between the vivid flashes of colour and music, it’s naturalism by another name. Matt Trueman has coined the perfect term for it: “realishism”. That “ish” is apt. This Streetcar is interesting-ish, elegant-ish. It puts a slight spin – both literal and figurative – on Williams’ play, but never enough to leave us giddy. Or put it this way: if you were expecting another classic done in the same vein as Andrews’ storming, vodka-fuelled Three Sisters, prepare to be disappointed. On the main stage of the Young Vic, Stella and Stanley’s cramped, claustrophobic apartment is a metal husk of a building. Magda Willi’s set strips out walls, leaving only the framework of the rooms through which an audience can peer. The characters are at one level exposed and at another trapped. This is the cage that Blanche knocks against, that Stella has no desire to get out of. Andrews’ production sets this space in almost perpetual motion, turning it clockwise, anti-clockwise and back again on the wide revolve. It’s slightly reminiscent of Ian MacNeil’s smoothly spinning set for A Doll’s House on the same stage, but while that design offered fleeting, cinematic tableaux between scenes, this keeps everyone queasily turning throughout. The sensation is one of constant shifts, but the only direction in which any of it can go is round in dizzy circles. Like any repetitive cycle, however, this one begins to get boring. In the first half, the pace is swift and the tension tight, coiled like Stanley’s unpredictable temper. But the momentum drops away after the interval as the production follows increasingly familiar tracks. 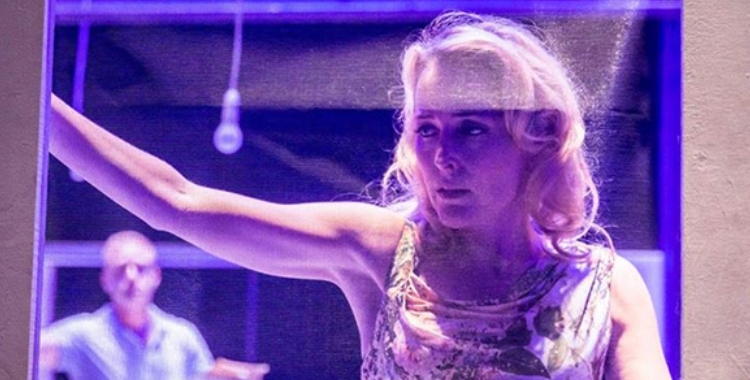 Andrews might half-heartedly update Williams’ play, kitting it out with Ikea furniture and skinny jeans, but Gillian Anderson’s Blanche is just as we expect her: flirtatious, fragile Southern belle, all carefully composed but rapidly cracking mask. Her downfall is competently conveyed, but never quite tragic. While Anderson fails to break the mould as Blanche, Ben Foster’s war-damaged Stanley is an intriguing take on the role. Rather than picking up the obvious cues from Williams’ descriptions of the character as primitively animalistic, Andrews and Foster seize on Stanley’s military history, suggesting a man broken by conflict. When his first major outburst arrives, it is truly explosive because it seems to come unbidden; this is not a man of naturally violent passions, but one shot through with an anger he is unable to control. Stanley’s reconciliation with Vanessa Kirby’s Stella, immediately following this scene, is another of Andrews’ successes. Their bodies meet in a rush of passion, their movements adopting a tango-like quality under the hot red glow of Blanche’s Chinese lampshade. The production is studded with little moments like this, small scenelets that elevate the quality of the rest. They are too sparsely positioned, however, to entirely rescue the bland expanses in between. It’s unclear, meanwhile, just what Andrews’ updating achieves. His Three Sisters wrenched Chekhov’s play out of any specific temporal context, brilliantly locating it on a timeless, abstract plane. The setting for Streetcar, on the other hand, is recognisably modern, but with few concessions to that modernity in Anderson’s performance. What the time shift does highlight, however, is the play’s gender politics. Watching, I’m more aware than ever of the limited borders of Blanche’s horizon. As she says at one point, her role as a woman is to entertain, to be beautiful. And the beer-drenched masculinity of Stanley’s poker games is not much of an alternative, trapping men within a system of rules and expectations that is just as restrictive, if endowed with a bit more power. These hints at an implicit gender critique, however, dissolve into obvious and borderline offensive imagery. To leave us in no doubt of either Blanche’s troubled mental state or the pressures of femininity heaped onto her, Andrews puts Anderson into a candy pink dress and wonky tiara, hair ruffled and face smeared with make-up. Southern belle transformed into dishevelled Barbie princess. It’s the crashingly unsubtle culmination of a dismayingly uninventive telling of this character’s trajectory, casting little light on its themes of mental health and sexual politics. From a director whose interpretation of Three Sisters was so bursting with invention, it’s a bitter disappointment.